A special thanks to our $2,500 Carnival Sponsor – Key Bank – without support from community-minded businesses such as Key Bank the Carnival wouldn’t happen. 2017’s Carnival wouldn’t happen without the support of great community-minded organization like Citizens Bank. Thanks! We are so grateful for sponsors like Mortgage America. Thanks for your $1,000 sponsorship. Saturday 7/2 (NEW Afternoon Hours and $10 Wrist Band Special 3-6 PM) – Carnival runs 3-10 PM with Fireworks to cap off the night! DUE TO THE PENDING SEVERE WEATHER EXPECTED TONIGHT THE FIREWORKS FOR SATURDAY JUNE 27th ARE CANCELED – NO RAIN DATE AS THE CARNIVAL ENDS TODAY AND HAS ALSO BEEN CANCELED. WE DO APPRECIATE EVERYONE’S PATRONAGE OF OUR CARNIVAL WE HOPE TO HAVE THE SUN SHINING FOR OUR 10th ANNUAL CARNIVAL IN 2016! It’s time for our 9th Annual Community Carnival! 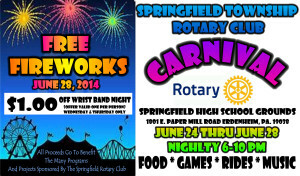 From June 23-27 each night starting at 6PM the carnival will take place in the parking lot of Springfield Township High School. 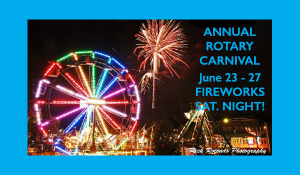 Food, Games, Rides and other fun is planned each night with fireworks set to go off on Saturday, June 27 once it gets dark, come early enjoy the carnival and grab a great seat for the fireworks. SPECIAL NOTE: We appreciate everyone’s patronage as we’ve worked around weather all this week: As for Saturday’s Fireworks: The Board is meeting tonight (Friday 6/26). We have until 10 am tomorrow to make a decision to cancel or hold the Fireworks. We will post on the website once a determination is made. There is No Rain Date at this time. Wrist Bands $20 all you can ride. • 3rd Grade Dictionary Project Throughout Springfield Twp. Advertise With Us! We have Sponsorships available for businesses to help support the carnival. This year we have added a new twist! For an additional $100, our business sponsors will be featured at all of our community events and sales thru May 2016. This would include events such as Community Day, Fruit Sales, Special Olympic Events and so on. This is a great way for our sponsors to get recognition all throughout the year! Just submit the form below with your check made out to Springfield Township Rotary and you’re all set. 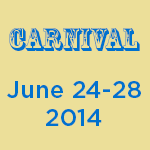 Save the date, our Annual Carnival will return to the parking lot of Springfield Township High School from June 24 – 28, 2014. Look for more information coming soon about Food | Fun | Fireworks. Join us each night starting at 6 PM for carnival rides, fun and games. It’s time for our 7th Annual Community Carnival! 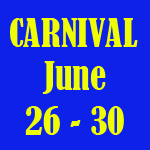 From June 25-29 each night starting at 6PM the carnival will take place in the parking lot of Springfield Township High School. Food, Games, Rides and other fun is planned each night with fireworks set to go off on Saturday, June 29 once it gets dark, come early enjoy the carnival and grab a great seat for the fireworks. Sorry Everyone, the weather on Thrusday, required us to cancel the carnival for Thursday Night 6/27 – Any tickets purchased are good Friday and Saturday Night. We have rescheduled One Price Wristband night to tomorrow $20 to ride all night on a Friday. That’s a great deal. Please pass this post on to all if your friends. Also don’t forget the fireworks on Saturday night, we’ll be playing it by ear on the weather, but please keep an eye on the sky! If there is lightning in the area, obviously we cannot hold a carnival or fireworks, but we’re hoping for clear skies. Plenty of free parking at the high school and middle school. 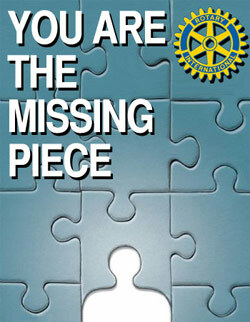 See you there and THANK YOU FOR SUPPORTING ROTARY! Advertise With Us! We have Sponsorships available for businesses to help support the carnival. This year we have added a new twist! For an additional $100, our business sponsors will be featured at all of our community events and sales thru May 2014. This would include events such as Community Day, Fruit Sales, Special Olympic Events and so on. This is a great way for our sponsors to get recognition all throughout the year! Just submit the form below with your check made out to Springfield Township Rotary and you’re all set. 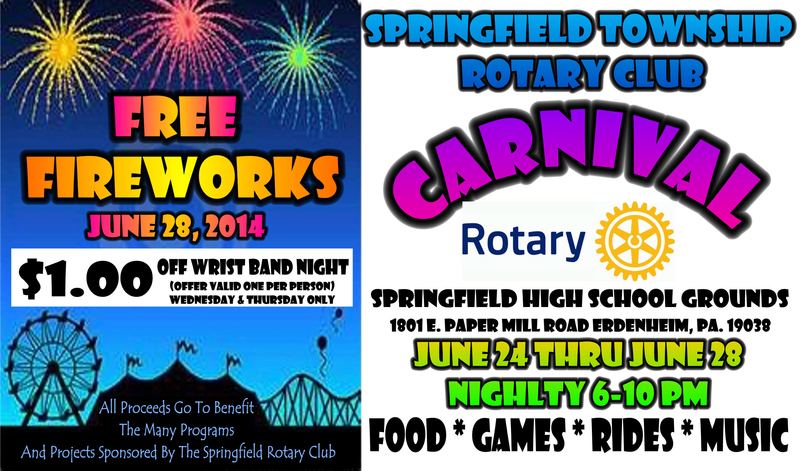 The Springfield Rotary Club will once again holds it annual Community Carnival. Last year’s carnival was a great success and was capped off with a fabulous Fireworks Display. This year we plan on having a great week and again capping off the carnival with an even better fireworks display on June 30 at dusk. June 26 – 30, 2012 the action starts at 6PM each night. WEDNESDAY & THURSDAY ARE WRISTBAND NIGHTS – $16.00 for ALL rides all night. If you have any questions, please feel free to contact Steve Schagrin at 215-272-8262.